We in California are waiting for the "BIG ONE"
Want to find out the answers? 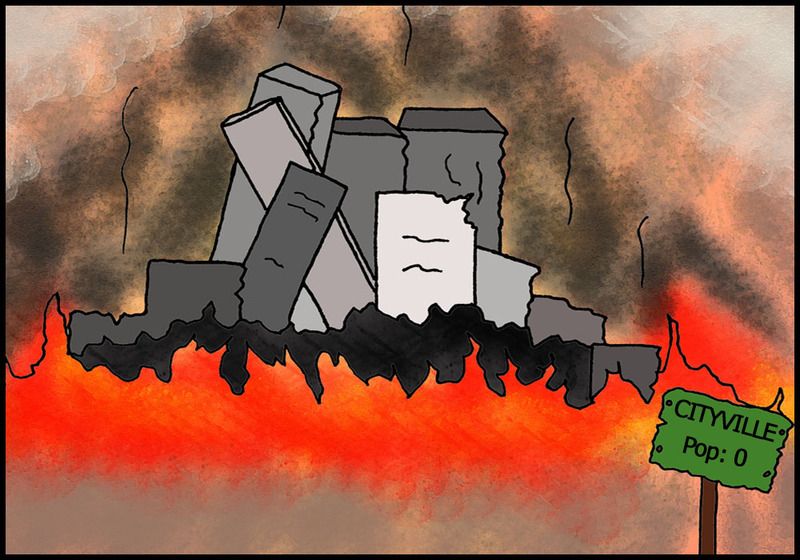 Geotripper is giving a public presentation at Modesto Junior College this friday on the things we "know" about earthquakes. For those who live outside the region, give yourself the quiz, and I will blog some answers over the weekend. One or two answers might surprise you! And yes, my students, I will give you extra credit if you take notes! Our national parks and monuments are treasures for so many reasons. One reason that is not always appreciated is the fact that many parks are noted for their status as a clean air reserve. 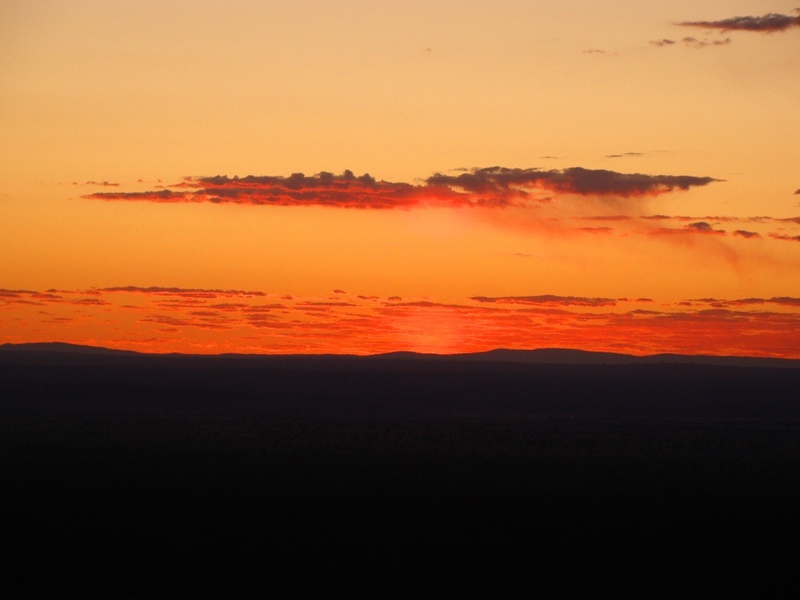 We city dwellers rarely have a chance to really enjoy the gift that nature provides in the way of colors when days begin and end. 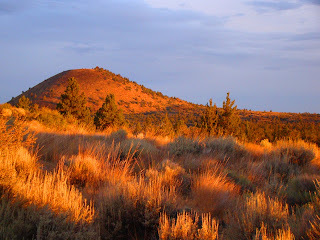 Lava Beds National Monument is a bit of landscape on the boundary between the massive Medicine Lake Highland volcano, and the Modoc Plateau. The region is practically devoid of people, and the air is often extremely clear. In my experience the park provides some of the most beautiful sunrises and sunsets that I have ever seen. This weekend was no exception. There is no sleeping in on mornings like these! The light easily penetrates the nylon walls of our tent, waking us and calling us to look out the window. Then we grab for a camera. It's September, the start of a new semester, and time for a last stab at field work in the high country! 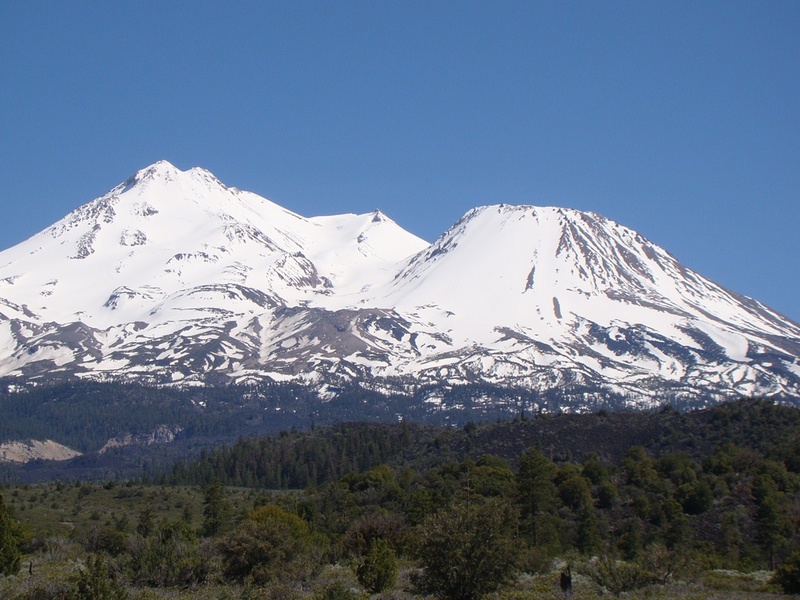 I'm heading out with one or two dozen students for an exploration of the California Cascades, the southern end of major chain of volcanoes that includes such luminaries as Mt. Rainier, Mt. St. Helens, Crater Lake, and Mt. Hood. 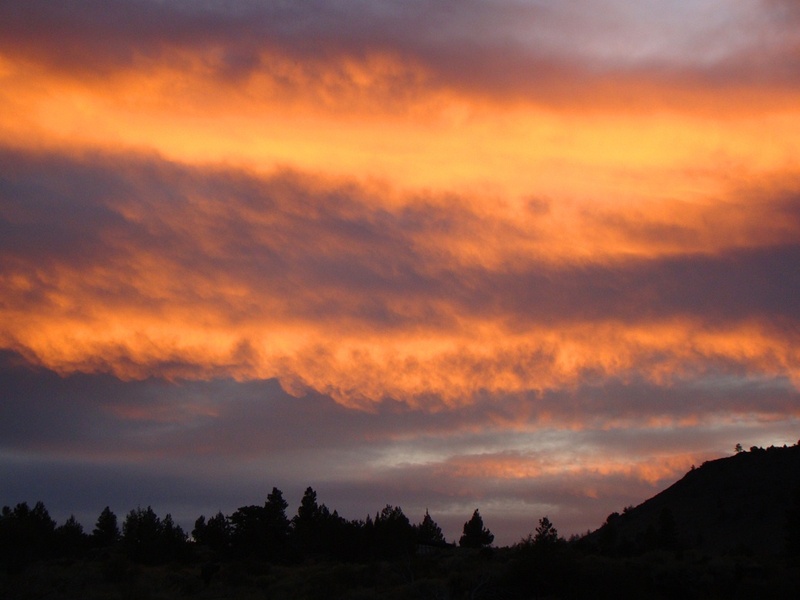 We will be taking an in-depth look at Lassen Peak, Mt. Shasta, and Medicine Lake Highland, some of the most intriguing volcanoes to be found anywhere. 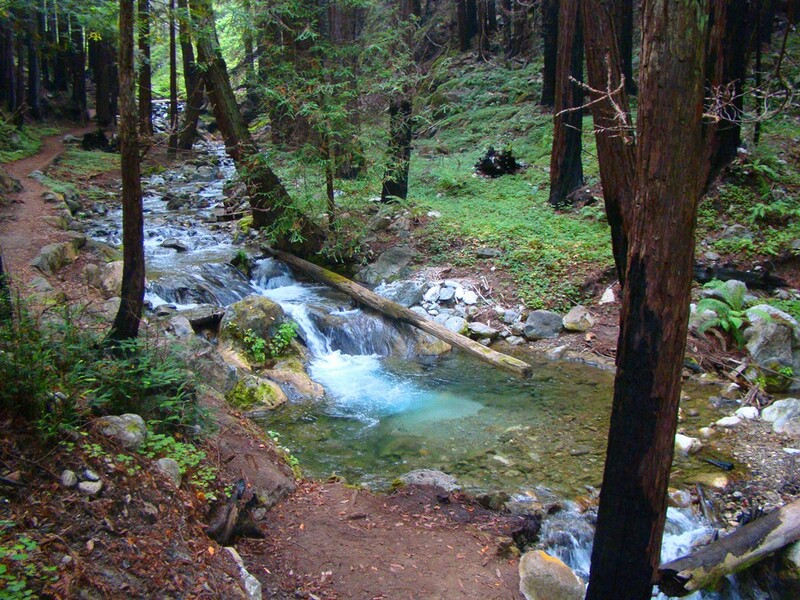 We will also be taking a last look at a couple of California's state parks that are slated to close within a matter of weeks. 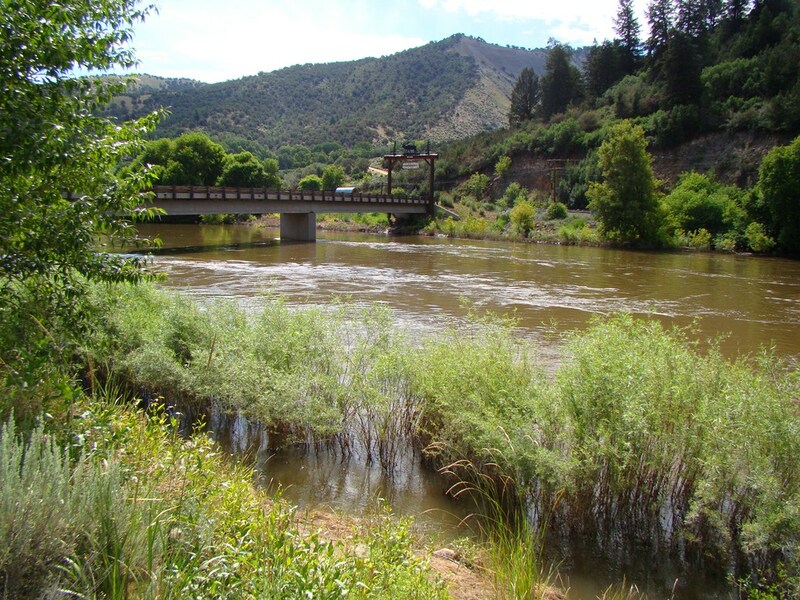 For the lack of less than a dollar from each resident of the state, we are losing 70 of our state treasures, including Woodson Bridge State Recreation Area, and Castle Crags State Park above the Sacramento River in the Klamath Mountains. I hope to be posting some new pictures of what we are about to lose of our state heritage because of the dereliction of duty by our state legislators. 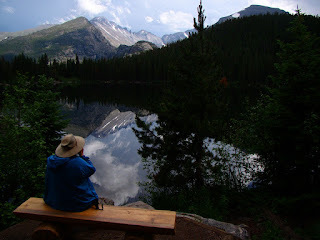 I'll be out of touch for a few days, but you might watch for updates on Twitter: @Geotripper. What a reprehensible and barbaric day for our nation. Two people were put to death today, Troy Davis, a man in Georgia who may have been innocent, and a man in Texas, Lawrence Brewer, who was guilty of one of the most heinous crimes imaginable, dragging a man to his death with his pickup. It makes me sick at heart that these events follow so closely after the shameful behaviour of the audience members at the Republican presidential debate where they cheered for Perry and his 235 or so executions. I blogged about this subject only two weeks ago, but I feel compelled to repeat part of my argument. Why? Because two weeks ago the question was hypothetical. Today it became all too real. The death penalty is wrong in so many ways, and it's easier to argue from the point of view of a person who was probably innocent, but the arguments need to apply for the monsters in our society whose acts defy all humanity. "Blood lust is an ugly, ugly emotion that is all too powerful. Revenge requires an eye for an eye, a tooth for a tooth, and human history is replete with stories of families, villages, and societies that have destroyed themselves and others over...whatever set them off in the first place. Civilization exists in large part because we have assigned the chaos of revenge to the state through various forms of a judicial system, and through the use of science in the assignment of guilt in criminal trials. 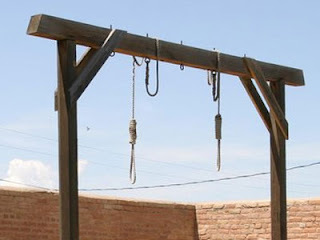 What bothers me is that most of the people who...[support the death penalty, even if some doubt remains,]... probably describe themselves as Christians, and given their conservative leanings, probably fundamentalist Christians. If you...[agree]... you need to consider what you really believe. I don't want to make an argument about "thou shall not kill". There have been centuries of theological justification for killing in self-defense or defense of others, whether in an individual case, or a national situation of war. But the problem is that capital punishment is not self-defense. By the time a person is strapped to the gurney, he or she is defenseless before the power of the state. If you really want to visit revenge upon someone, what could be worse than being locked up in a concrete cell for the rest of one's life, with no chance ever of release? Why isn't that enough revenge? Such people are no longer a danger to society. A person who is guilty of murder is under condemnation, whether from God or from the state. One can fairly say that such a person deserves death. 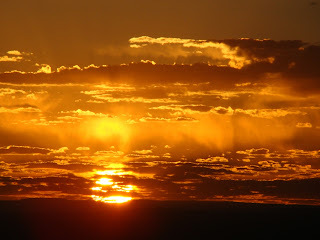 But if you know anything of New Testament theology, you know that "everyone has fallen short of the glory of God", and that all deserve death unless they seek forgiveness, and God loves everyone so much that he seeks that redemption for all people. All they have to do is ask. I don't want to sound like I'm preaching here; I am paraphrasing the arguments and entreaties I see over and over in tracts and hear from televangelists in the media. By killing those who have transgressed, the society removes the chance that such people would ever find forgiveness and redemption. And by the words of Jesus, "...they that are whole have no need of the physician, but they that are sick: I came not to call the righteous, but sinners to repentance". And there is no one sicker than a murderer. So what are we to make of those who call themselves religious and yet cheer for executions, and who vociferously support capital punishment? They want revenge. And revenge is antithetical to the Christian religion. Again, the words of the Jesus: "You have heard that it was said, "An eye for an eye and a tooth for a tooth". But I say to you, do not resist an evildoer. If anyone strikes you on the right cheek, turn to him the other also." If one claims to be Christian, these words seem as clear as can be about the attitude one should project. 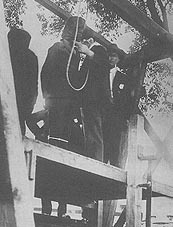 Politicians continue to call for the continuation and expansion of the death penalty, and consider this some sort of principled stand. They are not principled. They are pandering to the basest of human emotions, and as such are guilty of moral cowardice." 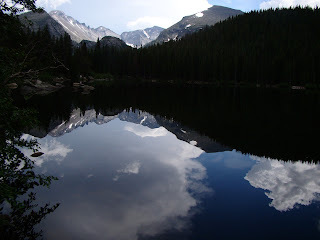 We set out on the road without a real itinerary, just a vague route and ultimate goal of reaching Rocky Mountain National Park, and some personal guidelines: find new things to see, either places that hardly anyone knows, or famous places we haven't been to before. We saw a lot of famous places, but often these places were made special by odd circumstances, like arriving before the crowds, or showing up after they have dispersed. In today's post, light and dark contrasts produced pure magic. 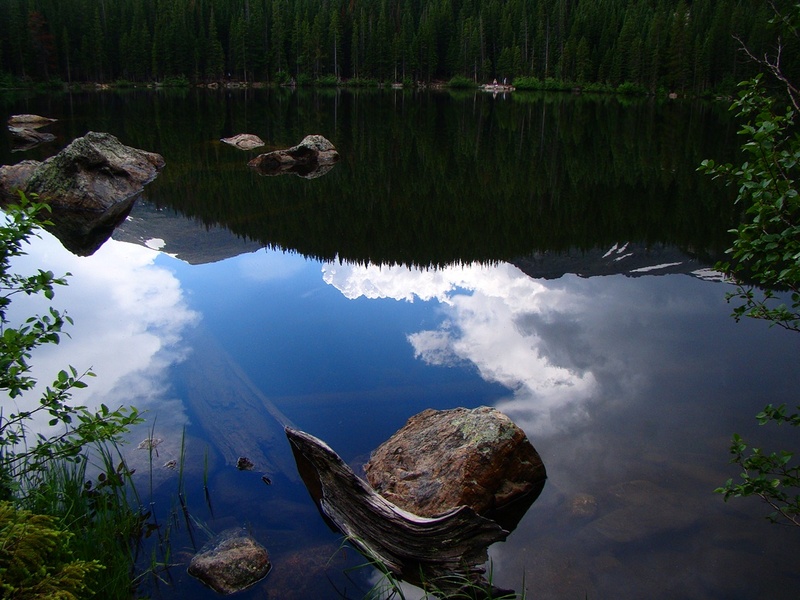 Bear Lake is a modest-sized glacial lake at about 10,000 feet in the central part of Rocky Mountain National Park. It is one of the most popular walks in a park known for wonderful hiking trails. The parking lot fills early in the morning, and a small army of volunteers spend their entire day directing traffic. 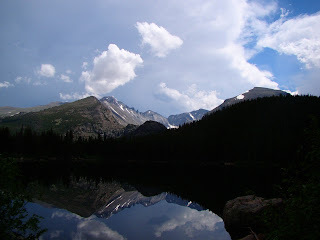 The lake is scenic, but on this day it was especially so; the air was absolutely still despite the storms looming on the skyline (we would get drenched a short while later). The effect was stunning, and the crowds seemed to realize it. 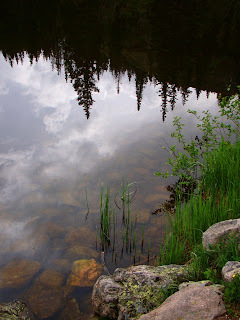 Everyone spoke in whispers along the trail, and kids weren't even tossing rocks into the water. 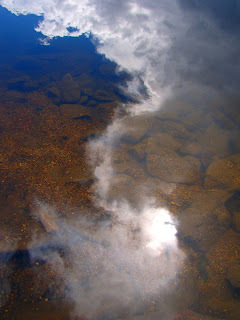 No one seemed to want to break the fragile peace of the still waters. The pictures that follow are the views we got as we strolled around the lake. Click on any of them for a larger version of the picture...enjoy! I'll be back to vagabonding in the next few posts, but it's a busy week and I have lots of photos to work through. In the meantime, I have two photos that crossed my desk this week, one a few years old, and one that has been recently acquired. The thing about them is that they both made my jaw drop, even though without context they look...almost mundane. Take this first picture, for instance. It looked to me like the surface of a mudflow in a desert environment, judging from the lack of finer sediments, and the relative sheen of the rock surfaces. A simple explanation is that it is an example of desert pavement with desert varnish, taken by someone who was using some archaic black and white film (does anyone know what film is? I have vague memories...). 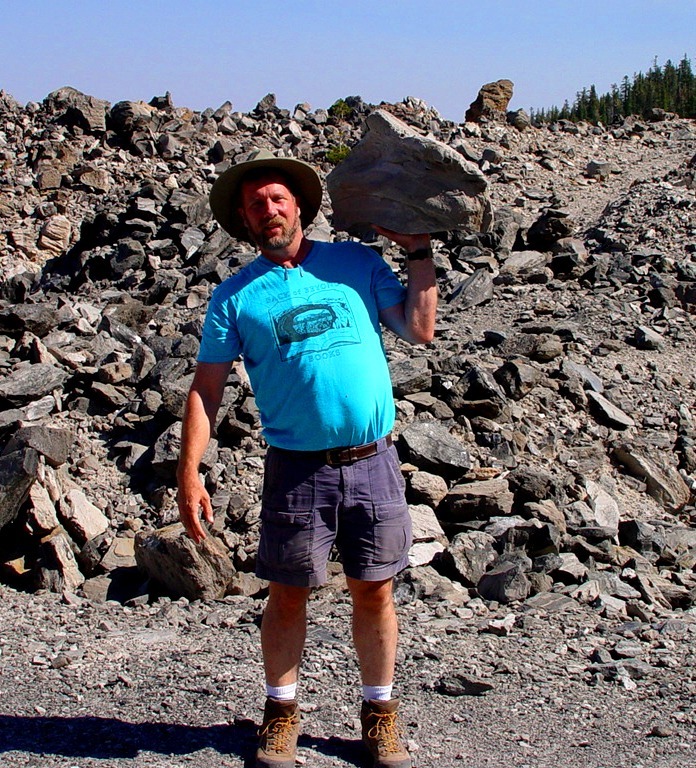 I appreciate blogger Glacial Till, who brought this picture to my attention last week (by coyly putting a picture of Titus Canyon in Death Valley to distract me). For more info on the Hayabusa mission to Itokawa, check out this site. The next picture is similar; it could have been taken in practically any desert environment. It looks like some wind has cleared off another piece of breccia of some sort. 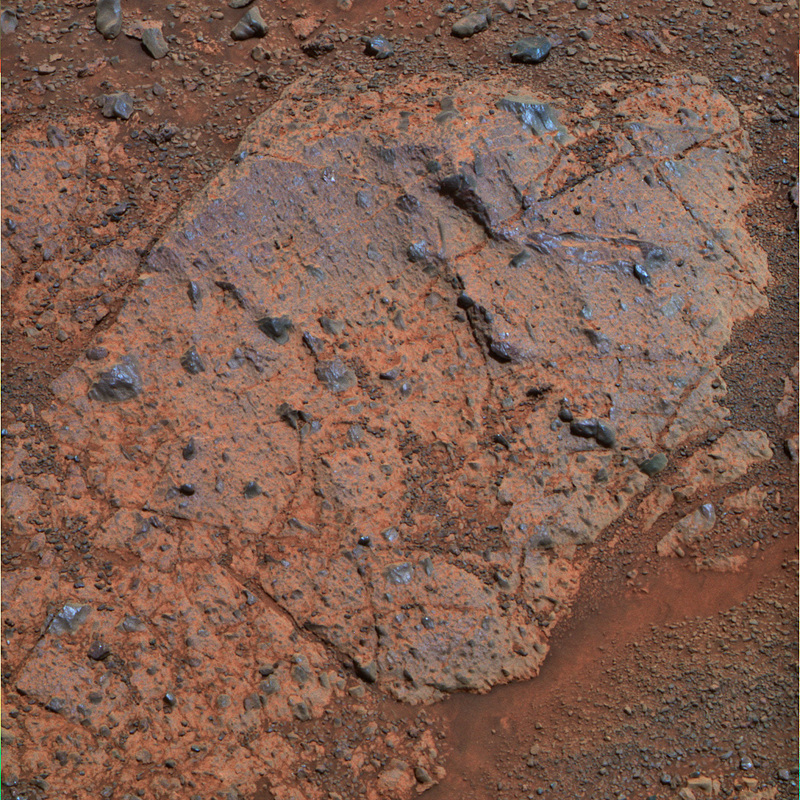 What's special is that this rock isn't on Earth either, it's on Mars. The Rover mission, slated to last for 90 days, has been continuing for seven years. This picture is hot off the press, taken just a short while ago (September 7) by the Opportunity Rover on the edge of Endeavour Crater. You can read a NASA press release about the rock here. 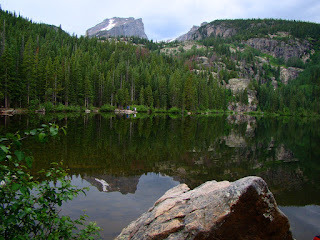 The rock is called Chester Lake. I can hardly speculate on the composition of the breccia. The Rover is doing some serious analysis of Chester Lake because it is an outcrop of bedrock, rather than crater impact debris. The Rover, like any geologist working an outcrop, has to look up once in a while to gain some context for the area they are working in. Here is a shot of the view from the site. The researchers have to be very selective about which rocks to test. I feel such a powerful desire to wander across this landscape, picking up and collecting all kinds of samples. Many thanks to Joel Hagen for bringing these photos to my attention. I can't begin to describe what incredible times we live in. When I was a young boy, I was fascinated with astronomy, and my most valued possession was a small telescope. Mars was such a compete mystery! It was a little red dot in my telescope, and little more in the largest telescopes in the world. 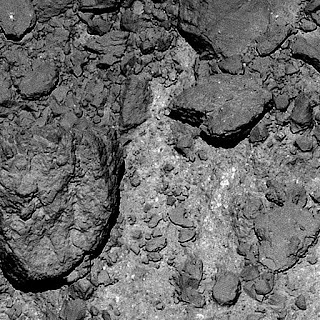 We could barely distinguish surface details on the planet, even though there were those who were sure they could see canals on the surface, evidence of some kind of civilization (who invaded us in the War of the Worlds and in Buckaroo Bonzai). I was a college student by the time our satellites started sending clear pictures of the surface, and today we are trolling about on the surface. We carry incredible pieces of technology in our pockets and purses that allow us to gaze on the surface of another planet (when we can pull our attention away from cute cat pictures!). Incredible times. We continue with our top ten list of TV theme songs that evoke a sense of place. Part one can be seen here. I was musing about the songs that have enshrined places to the extent that we are taken there whenever we hear the tune. We started with my top five choices, Hawaii Five-O, Magnum P.I., Gilligan's Island, Star Trek, and Bonanza. Number 6 on my list will have to be a three-way tie. The locales are not famous geologically, but as geologists like to note, geology is everywhere, including under cities. Especially under cities where geologic hazards strike. So we have Taxi, Cheers, and Hill Street Blues, three shows that were tied to famous urban centers. First, there is New York, setting for dozens of TV shows, but my favorite theme song comes from Taxi. NYC may be a hive of hyperactivity and paranoia, but the strains of this musical theme make me bliss out. The show was classic too. The second tie for sixth place goes to Boston's favorite watering place, Cheers. The visuals are as sweet as the song, and I always get irritated when syndicated reruns cut out most of the song to make room for more commercials. The third tie for sixth place goes to Hill Street Blues. "But wait", you say, "Hill Street Blues? What locale does it belong to?". And your point is well taken. The city is never named. The series was filmed in Los Angeles, with some exterior shots filmed in Chicago. The squad cars look Chicagoan. So we don't know, actually. So Hill Street Blues evokes a place that doesn't exist, but it sure was a hell-hole of a city wherever it was. This leads me to the final selections: shows that evoke special places, but the places are not where we think they are. 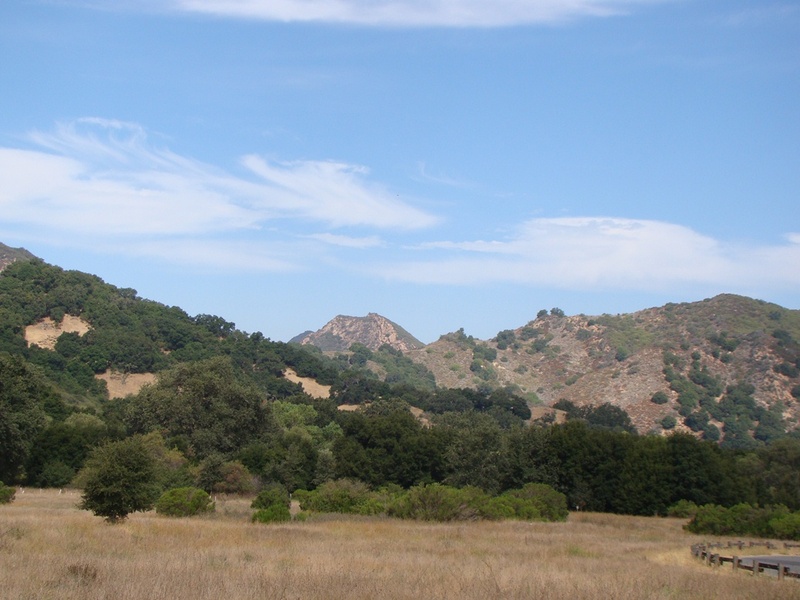 Number 7, for instance is M*A*S*H, which famously evoked South Korea, but was generally recognized as a proxy for the Vietnam War, and which was filmed in...Malibu Canyon, California! I still have no real idea what the landscape of Korea, North or South, looks like. A picture from my recent visit to "Korea"
Number 8 on my list is famous in my mind for having no connection whatsoever with ANY landscape or sense of place: Mission Impossible. It was never clear where the MIF team was based, and their adventures seemed to always take them to small communist or totalitarian states in Eastern Europe or Central America, but their writers must have spent days coming up with imaginary names for each of these little city-states. The opening credits always reflected this ambiguity, since it was different every week, except for the music. That's what I like about the particular clip I found on Youtube; you'll notice that it restarts four or five times, with a different Hollywood set in each. And then there are cost-saving measures related to filming in expensive cities. Number 9 on my list is my favorite cable series of all time, Monk. Adrian Monk is an incredibly obsessive-compulsive former detective for the San Francisco PD who is a genius when it comes to solving mysteries. The opening theme song begins with a view of the Golden Gate Bridge from the Marin Headlands, and continues through other parts of the city. The first season began with a ditty by Jeff Beal. The remaining seven seasons began with Randy Newman's "It's a Jungle Out There", which is a fine piece of work, but I always liked that first tune better. But somehow, scene by scene, "Monk" looks nothing like the San Francisco I've ever seen. Few of those Victorian houses and unique hills and urban skyline (not to mention the fog). Season one was filmed in Vancouver and Toronto, while others were filmed in Los Angeles, with a few exteriors from San Francisco thrown in here and there. Another cable show, Psych, is even more egregious. While ostensibly set in Santa Barbara, California, the exterior shots show very little of the town I once lived in. 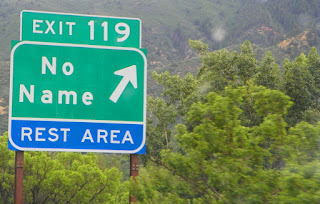 The locations and street names mentioned are right, but somehow, the Santa Barbara of the series is thick with conifers and green meadows, and there is very little Mexican or Spanish-style architecture in evidence. The landscape looks downright...Canadian...it's filmed in Vancouver for the most part. The last show on my list is actually one of my favorites of all time, and the music and visuals evoke the landscape most vividly: the little town of Cicely, Alaska. Northern Exposure begins with a moose wandering down the middle of the towns main street, and there is the memorable mural for the Roslyn Cafe. The show that followed included some of the best written dialog in television history. One of my favorite geology-based episodes involved the town enjoying a barbecue of frozen woolly mammoth (Dr. Joel had been trying to get a paleontologist out to the site when the mammoth disappeared). The funny thing, of course, is that it wasn't filmed in Alaska, it was filmed in the former coal mining town of Roslyn, Washington, on the eastern slopes of the Cascades east of Seattle. The little town is proud of their heritage as a set for the series, and the Roslyn mural and the KBHR radio station are still maintained. I could not find a Youtube for the Northern Exposure opening credits (UPDATE, see below), but I did find something I missed the first time around: the final five minutes of the 7-season series. It is nice when the characters of a long-running series get to say goodbye, and I had never seen this episode. Even nicer was the song they used, "My Town", by Iris DeMent, one of my favorite singers. I found this scene touching, given my familiarity with each of the characters. That's my list. Of course it is highly subjective, and I would love to hear some of your favorite choices. While I was working through my choices, I came across a scene (not an opening credit) of one of the more powerful moments I've seen on television. I used to watch "ER", but kind of stopped paying attention after season eight when Dr. Mark Greene passed away. 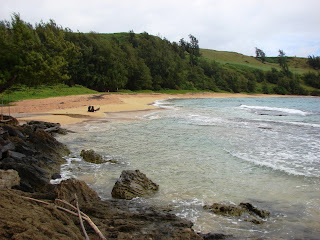 A song lingered in my head for a few hours the other day, and I found myself wandering like an ethereal spirit someplace different, specifically on a beach in Hawaii. It was quite literally like an out-of-body experience. I could feel the warm air, the bright sun, the light sea breeze...I could even hear the waves crashing, and after a moment I realized that Steve McGarrett just might walk through the door into the computer lab where I was struggling to finish a long program review document. These are not in any particular order, but the first two probably represent the top of my list. Hawaii Five O has the most unforgettable opening theme of any television show in history. Composed by Morton Stevens and performed by the Ventures, it is one of the few songs that can stick in my head all day and not drive me up the wall. You may or may not know that there is a new Hawaii Five O on CBS right now. It's ok, and I tune in to see the scenery backdrop, but I was upset that they took the opening theme and cut it half! The first night the show was on, I actually went online just to bring up the old theme and play it all the way through. The show itself hasn't aged so well though. The plots were more sophisticated in my memories than in fact, and the actor's behaviour at a crime scene was appalling. Acting was stiff and wooden; watch an old episode some time and notice that whenever there is an office discussion of the case, everyone but McGarrett stands with their hands firmly at their sides, never moving. Any plot that required hippies or protesters was, um, clumsy and stereotypical. Still it was one of my favorite shows of all time. I read somewhere that when Hawaii Five-O went off the air in 1979, after twelve seasons, there was an entire institution of studios and film crews left in Hawaii who had nothing to do anymore, so they more or less invented a new series. It was about some happy-go-lucky private investigator who lived in Hawaii who was named, um, something like Remington, or Colt, or Magnum, or something like that. Oh, it was Magnum, and the opening theme is second on my list! The show, half comedy and half drama is one of my enduring favorites, and now that the DVDs are out, I realize the show has weathered the years quite well. They made great use of the landscape in most episodes, especially since a helicopter flight with the character T.C. was often an important plot point. One got a real sense of the geography of the islands, especially Oahu. If you are only marginally familiar with the series, you may not know that the whole first season of episodes had a totally different theme song. It wasn't very good at all (check it out below). Third on the list is one of those songs that will, in fact, drive you nuts in a few minutes if it gets stuck in your head, but it evokes a sense of place as sure as any other song on this list: The Gilligan's Island theme. Although the specific locality of the "island" is never mentioned, it existed on a studio lot in Hollywood. But the pilot for the series was shot on the Hawaiian island of Kaua'i, and I've been there. I've been to the real Gilligan's Island! So my question is, instead of trying to get off their island, why didn't they just go up the beach to the housing development? Trivia question of the day: What was the Professor's name (the character, not the actor)? Theme number four evokes a sense of place, but it evokes a place nowhere near Earth...Star Trek. Number five on my list is a theme song that takes me to two places. The first is Lake Tahoe, one of my favorite local destinations, and the other is my youth. My grandparents NEVER missed "Bonanza", and so that music has the ability to turn me into a six-year-old child spending a night at the grandparent's ranch (the two acre ranch was in south Ontario, California; how many southern Californians can remember when Ontario had ranch properties?). That's it for Part one of this exploration of television theme songs that evoke a sense of place. 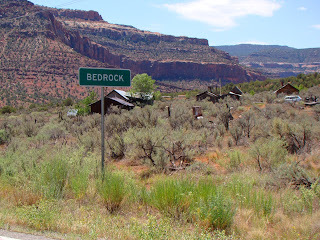 We do have an extra bonus theme song for a place that you all thought didn't really exist at all: Bedrock! Well, it does exist. I saw it this summer. 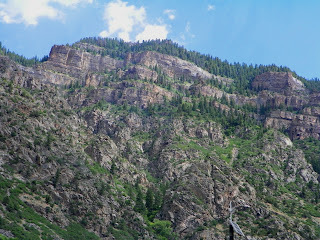 It's in the extreme western end of Colorado, in the Paradox Valley. I did not see any dinosaurs, or Fred or Wilma. It is conceivable that some dinosaurs would be found nearby, entombed in the Mesozoic rocks that form the local cliffs. It's Collect Rocks Day, What Shall I Do to Celebrate? 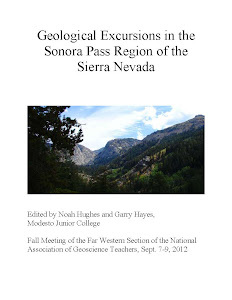 Well, I think I shall take a group of college students to the California Cascades, look at some volcanoes, and see if there are any rocks there. By a miscalculation of planning, we aren't leaving until next week, but the importance of this very special day will be close to our hearts as we wander around Northern California!. 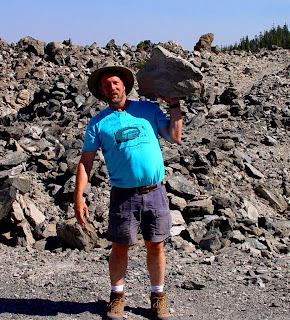 I blogged about Collect Rocks Day a couple of years ago, and almost missed it, again. I'm not sure where this all originated, but I'll take any excuse! No, this is not really a post about the last line from 2001: A Space Odyssey. 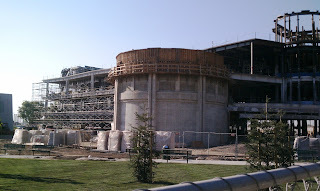 It's about the planetarium that is beginning to emerge in the center of the photograph. It will be full of stars in a manner of speaking very soon, and there will be lots of children inside who will be learning about the wonders of the Universe. This is exciting news for those of us who live in the Modesto area. For all the time I spend on this blog talking about the wonders of California, well, sometimes Modesto and the surrounding area comes up a bit short. We have been declared 99th out of 100 on the best places to live in the US by some compilers, and that is because we have some of the worst air quality of any place in the nation, and are kind of famous for having the highest, or near highest rate of stolen cars. Our economy is in a shambles. You think that the national unemployment rate of 9% is bad? Ours is around 18%, and many of the rest are underemployed, working part-time. Benefits? Hardly. I'm not sure I can recall any time in the last twenty years that the unemployment rate has fallen below 10%. It is truly a depression here. Part of our problem is that we have one of the most uneducated populations anywhere. It's actually so bad that a local pundit suggested that instead of trying to educate our children for a better future, that we concentrate on bringing in more employers who specialize in unskilled laborers, because that's the only "short-term" solution that he can think of. The problem has always been that those kind of short term ideas become permanent. I can't accept this. It's a hopeless attitude, and it is poisonous. Education has to be the ticket to a better community. That's the reason I've been in the trenches here for twenty years, along with many primary and secondary school teachers who work without resources and with poor institutional support. They're good people trying to make a difference for their kids. That's what makes the picture above so exciting. Several years ago, the community decided to invest in a better future, and voted for a huge bond act to finance the renovation of our college, almost from the ground up. 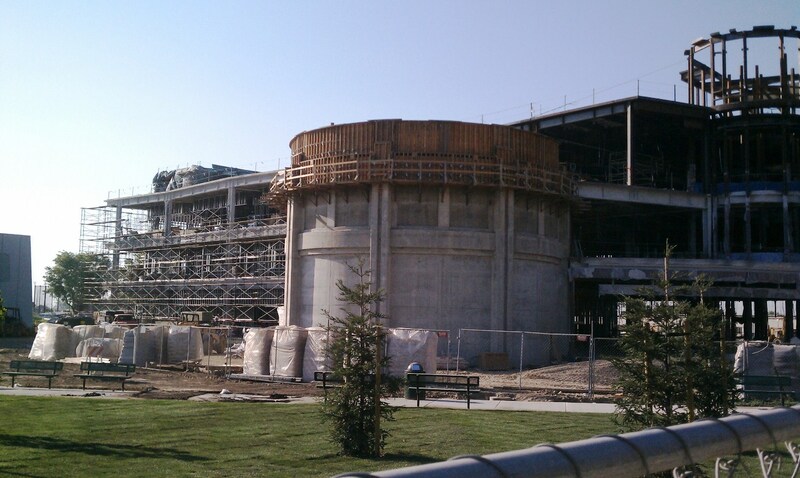 One of the centerpiece projects is the Science Community Center. Our center may very well open for classes in the fall of 2012. For the first time, our college students and children from area schools will finally have access to a state-of-the-art planetarium, an observatory, and a natural history museum that until now has been housed, well, in an old house. There will (probably) be an outdoor learning environment with a large pond and native vegetation.There will be a modern facility for the chemistry, physics, biology, and astronomy laboratories, and more to the point: new classrooms and labs for earth science and geology! Our local community decided to fight for a better future. 99th? We've got our problems and we'll probably never be a swanky chic city that vies for number 1. But we'll make sure our kids have a decent chance to learn about the fascinating world that exists out there, and the cosmos beyond. They deserve that much from us. They certainly don't deserve the kind of thinking that says build another sweatshop, and pay them minimum wage. 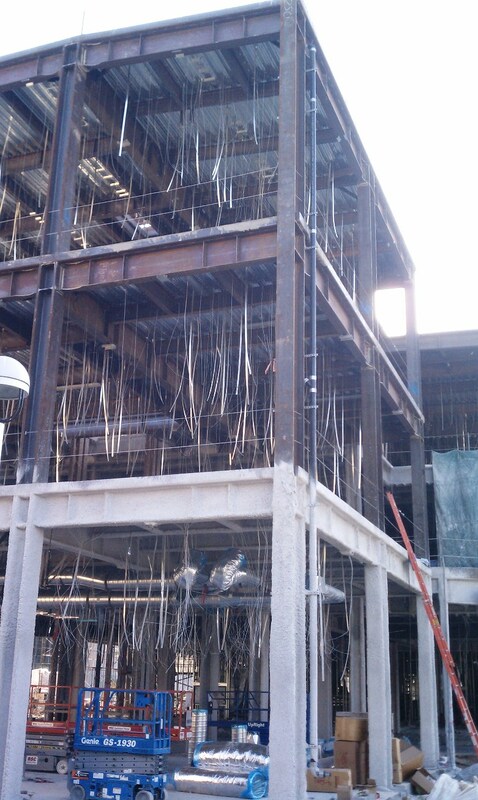 That's my office on the third floor. It actually has a floor, sort of, but still lacks walls. 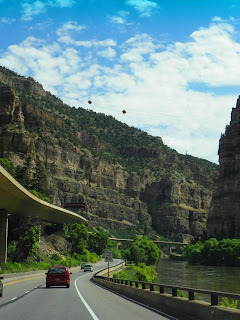 Vagabonding across the 39th Parallel: A Canyon Along The Colorado River? Really? A few weeks ago I was writing about my summer vagabonding along the 39th parallel as if it were a fresh memory of a just competed trip. Now, three weeks into a new semester, I find myself remembering the trip as a dim, distant recollection of a gypsy-like life without responsibility. What a difference working again makes (but I'm not complaining about working!). The Colorado River and its tributaries are life to the Southwest. 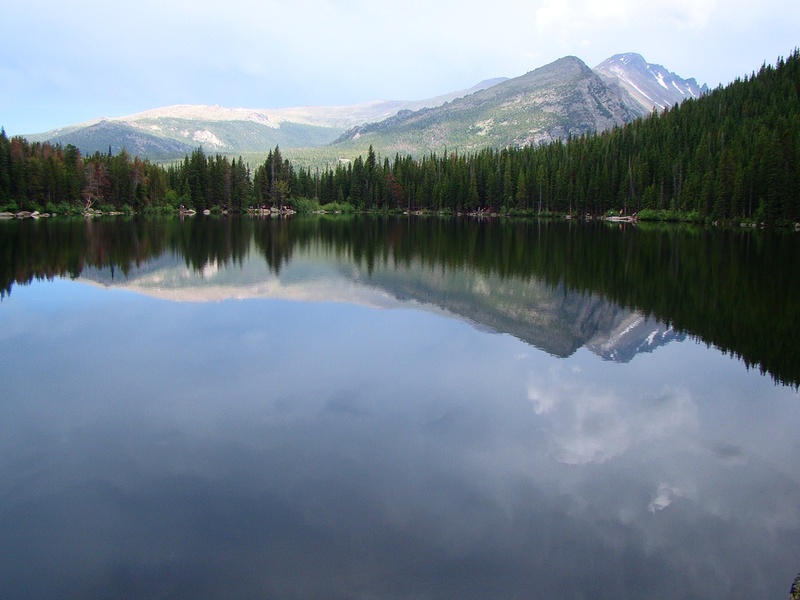 It is the only major water source for Arizona and Nevada, and is a critical component of the water used by California, Colorado, Utah, Wyoming, and Northern Mexico. Any discussions of water allocation and the effects of ongoing climate change on the river are political minefields. To many people, though, the Colorado River means the Grand Canyon in Arizona. 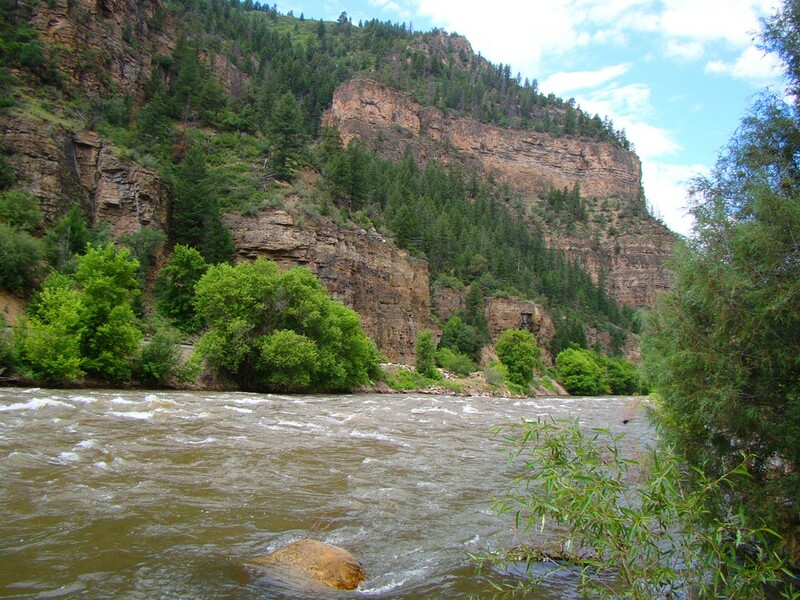 Those who are more familiar with the area realize the Colorado represents many canyons. The river drainage crosses so many unique landscapes that no single description can characterize the river: Cataract Canyon, Black Canyon (two of those, one in Colorado on the Gunnison tributary, and the other downstream of Lake Mead), Flaming Gorge and Lodore on the Green River tributary and many others. In other places, the river flows through broad, relatively unspectacular valleys. That's what happens in western Colorado. Between Glenwood and Grand Junction, the river flows through exposures of the easily eroded Mancos Shale. It might not be spectacular in the scenery sense, but it makes transportation routes a lot more easy to plan. 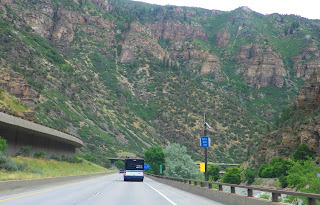 Interstate 70 and numerous railways follow the river in this area. Upstream of Glenwood Springs the river is emerging from the foothills and ridges of the Rocky Mountains, and the river is forced to flow through yet another spectacular gorge, Glenwood Canyon. Millions of travelers have traversed Glenwood through the years, but not me. 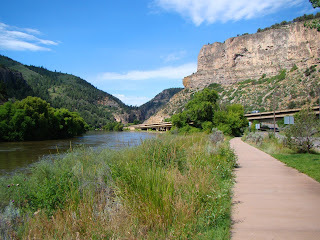 The rules we set for ourselves on this trip were to see as many new things as possible, so Glenwood showed up on our vagabonding itinerary despite being famous and heavily traveled. It was quite a sight. I'm committing one of those odd little sins of geography that Glenwood inhabitants might take umbrage to. 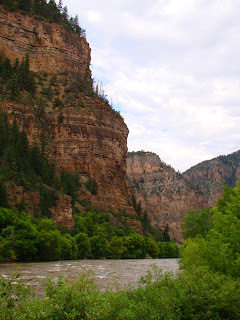 I'm going to suggest that Glenwood Canyon reminded me of the Grand Canyon, only with forests. In my defense, let me point out the particular similarity. 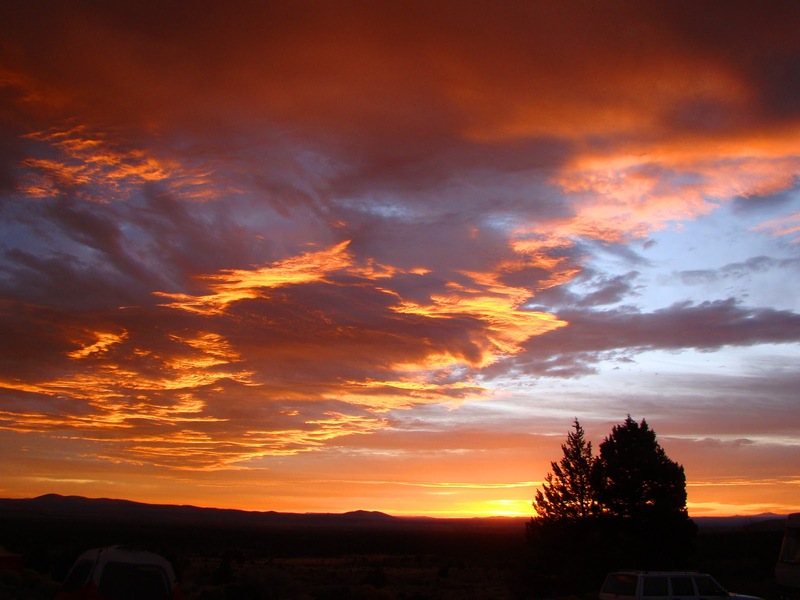 Because the canyon was forced by erosional and tectonic circumstances to cut through a plateau, it carved deep into the crust, deep enough to expose some of the metamorphic basement rocks that are among the oldest found anywhere in the American Southwest. 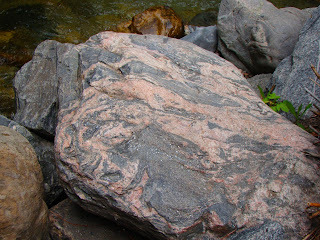 The gneiss and schist exposed here are 1.7 billion years old. The rocks were beveled by intense erosion and later covered by sedimentary rocks that are around 500 million years old (an unconformity). 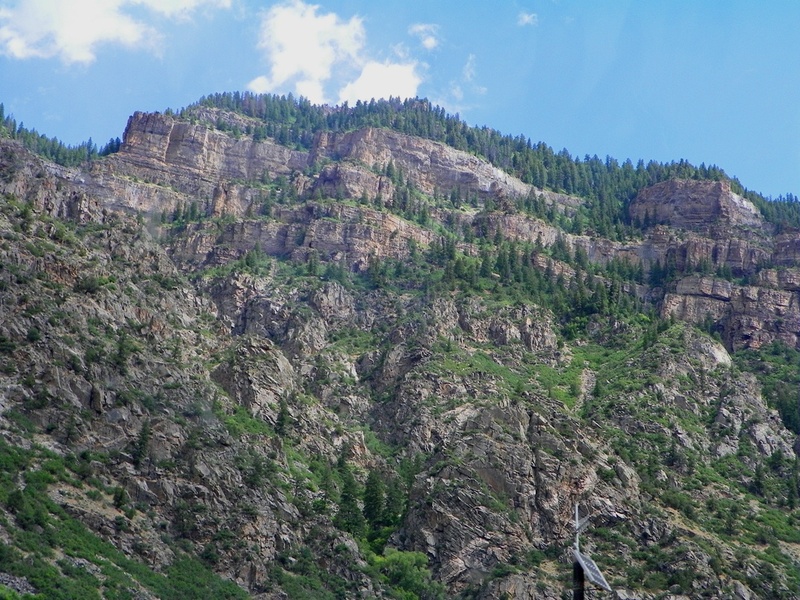 The higher cliffs are composed of Paleozoic sedimentary rocks. This is the same relationship seen in the deepest part of the Grand Canyon. Gneiss is one of the most beautiful of rocks, with an astounding variety of minerals, depending on the circumstances under which it formed. The rock found in Glenwood is highly contorted because of its origin deep in the crust where it was put under tremendous pressure, and heated (almost to the melting point). It has been intruded by granite and pegmatite veins, beautiful rocks in their own right. 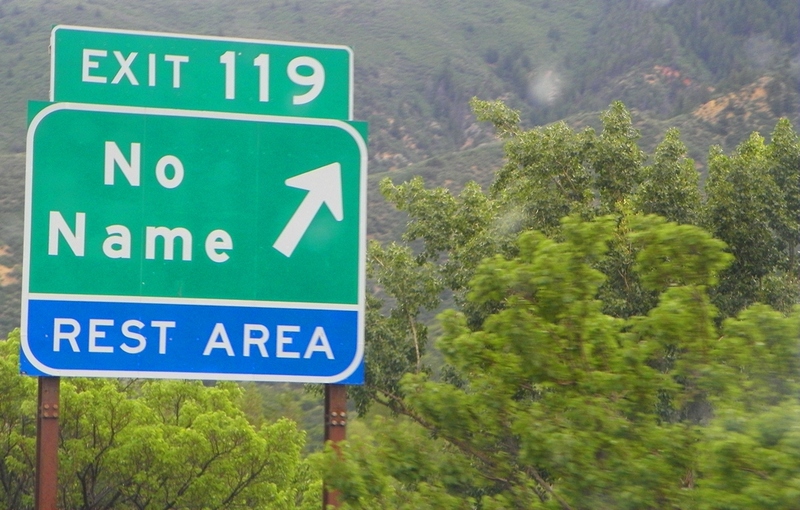 In Colorado, people traveling in an east-west direction have a problem. It's called the Rocky Mountains. Passes below 10,000 feet are practically nonexistent, other than those on Highway 40 in the northernmost part of the state. Despite the deep narrow nature of Glenwood Canyon, it is part of one of the most important transportation corridors in the state. 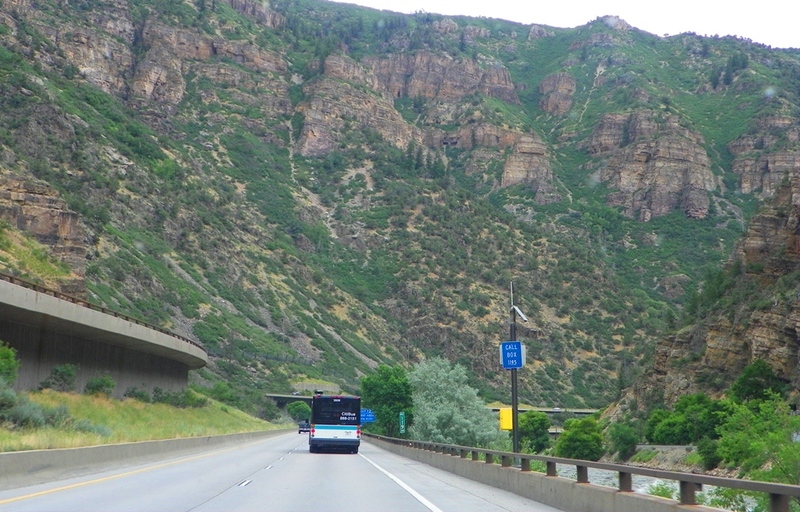 Trains and autos have used the canyon for more than a century, but the road that was present was not a high-speed modern highway, despite being part of Interstate 70. That changed in the 1990s. If you think the road seems highly engineered, you are right. No one could mistake the gorge for a pristine wilderness, but a normally configured freeway would have involved a large number of huge roadcuts and unsightly scars on the canyon walls. 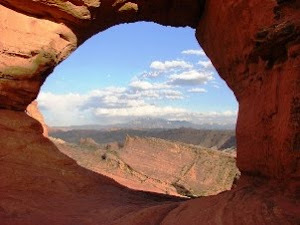 A great effort was expended to minimize the disruption to the canyon. There are an unusually large number of rest areas for a 12 mile stretch of road. There are four, including the rather creatively named "No Name Rest Stop" at the western end (and in the first photo). The parking areas provide trailhead access to a number of interesting destinations, including Hanging Lake, an unusual travertine terrace. Unfortunately we didn't have a chance to check it out on this trip. The Colorado River was in a bit of a rage. It has been high as a result of near-record snowfall and a late spring, but in the middle of July it was actually covering the concrete bike trail and stairwells along the river. 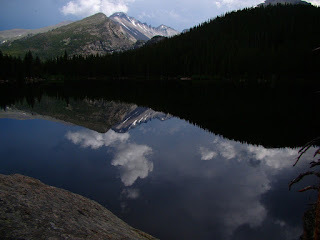 We were about to experience part of the reason; there had been some heavy thunderstorm activity for a few days. It has been a crazy year in so many ways. I've got two subjects I'm bringing up in this post, and they are indeed a departure from my usual subject matter. I tend to avoid overt political/religious subjects in favor of environment and geological issues (the previous post is an example of subjects I do cover), but I was so appalled by what I saw the other night that I can't help but comment. Brian Williams was asking Texas Governor (and presidential candidate) Rick Perry about his 234 executions, and the audience applauded. Loudly (see it here). What kind of people do this? An execution is cause for introspection and sadness; it isn't a time for jubilation. And here is a crowd that cheers for a governor who has presided over 234 executions, including one of a man who was in all probability innocent. Rick Perry even fired members of a commission investigating the case before they could present their conclusions. What also disturbed me was a quote involving a Republican focus group: "It takes balls to execute an innocent man". Blood lust is an ugly, ugly emotion that is all too powerful. Revenge requires an eye for an eye, a tooth for a tooth, and human history is replete with stories of families, villages, and societies that have destroyed themselves and others over...whatever set them off in the first place. Civilization exists in large part because we have assigned the chaos of revenge to the state through various forms of a judicial system, and through the use of science in the assignment of guilt in criminal trials. What bothers me is that most of the people who applauded the other night probably describe themselves as Christians, and given their conservative leanings, probably fundamentalist Christians. If you were in that audience, or if you agreed with their actions, you need to consider what you really believe. Politicians continue to call for the continuation and expansion of the death penalty, and consider this some sort of principled stand. They are not principled. They are pandering to the basest of human emotions, and as such are guilty of moral cowardice. And speaking of revenge, we have 9/11. One cannot avoid the subject this weekend, the 10th anniversary of the attack on the Pentagon and the Twin Towers. What did we learn as a country? I'm not sure what to think anymore. Or maybe I am: We changed our country into a society ruled by fear and paranoia. Politicians took advantage of the fear and desire for revenge to squander our country's resources and reputation on two useless wars. We as a nation are guilty of the deaths of uncounted thousands of innocent bystanders. We are guilty of atrocities and state-sanctioned torture.Was it enough? Did it feed the blood lust? It must have, because we barely think about the two wars anymore. Except of course if you are the soldier still fighting the war, or are part their families back home. Or if you are one of thousands of wounded soldiers languishing in substandard hospital facilities. We weren't, and aren't, willing to sacrifice for the war effort. We certainly aren't willing to pay for it. How long would these wars have lasted if taxes were raised in direct proportion to the cost of conducting the military operations? The national debt that is so vociferously decried by conservative lawmakers is largely there because of the wars, wars they universally supported. I support our troops; I think we should bring them home, and take care of those who are wounded, whether in body or mind. They served their country. Their country is not serving them. 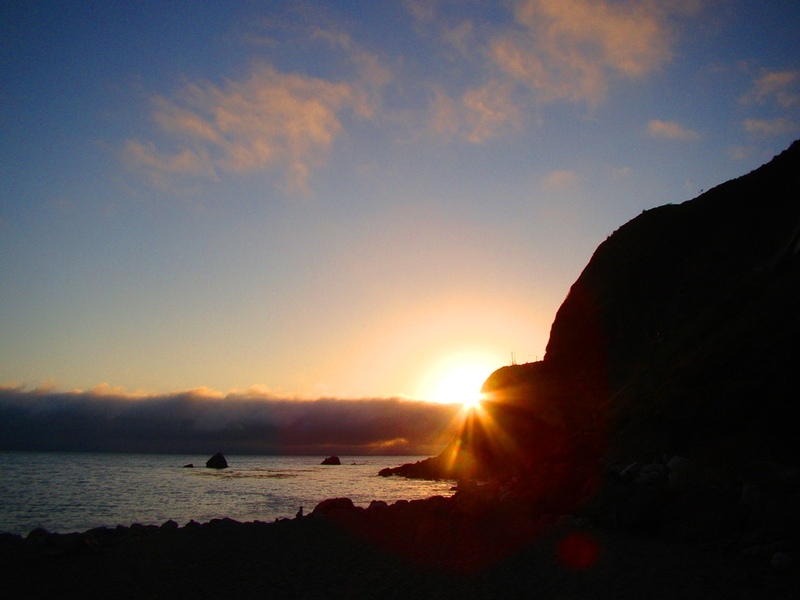 Limekiln State Park is closing. As soon as next month, you will not be able to visit this precious place. 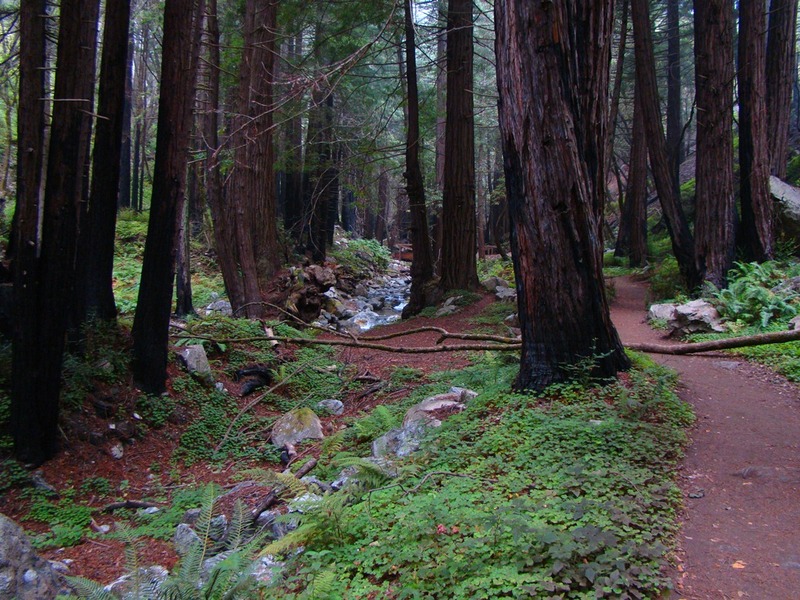 For the lack of $22 million dollars, 70 of California's state parks will be closing down. That's an average of just over $300,000 per park. 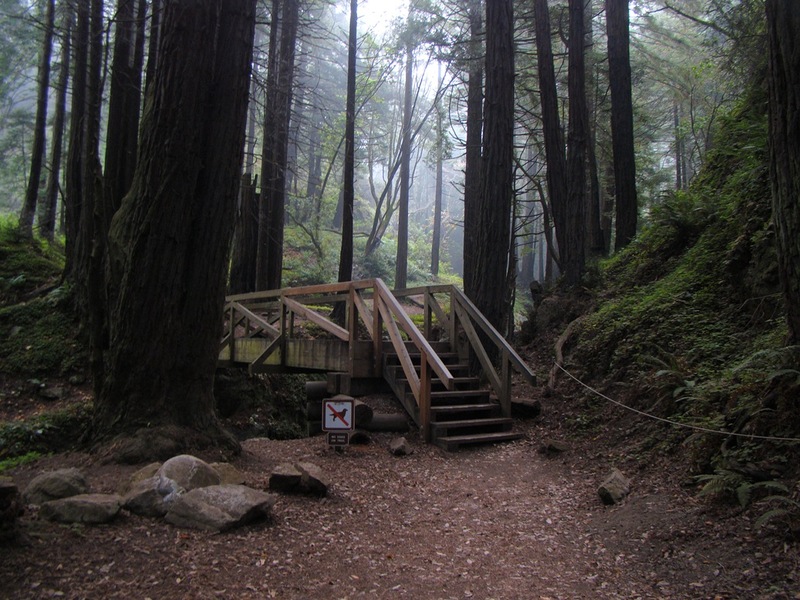 The math is appalling: a single penny from each resident of California could keep Limekiln State Park open. A mere 70 cents or so from each resident could keep all 70 parks open. But our legislature couldn't do it. Our legislature, because of a minority party so intent on never raising taxes for any reason at all, would not even let the people of California choose for themselves whether to keep the parks through the referendum process. I am ashamed of this legislature, and I am ashamed that I am represented by a senator and an assemblyperson who are part of the Republican party. What is it worth to these people in the legislature to make sure their rich benefactors don't pay a few extra dollars in taxes? Is it truly so important to them that they would destroy the things that can make California a livable place? The education system of our state? The safety net for the most vulnerable of our citizens, the poor, the sick, the infirm? 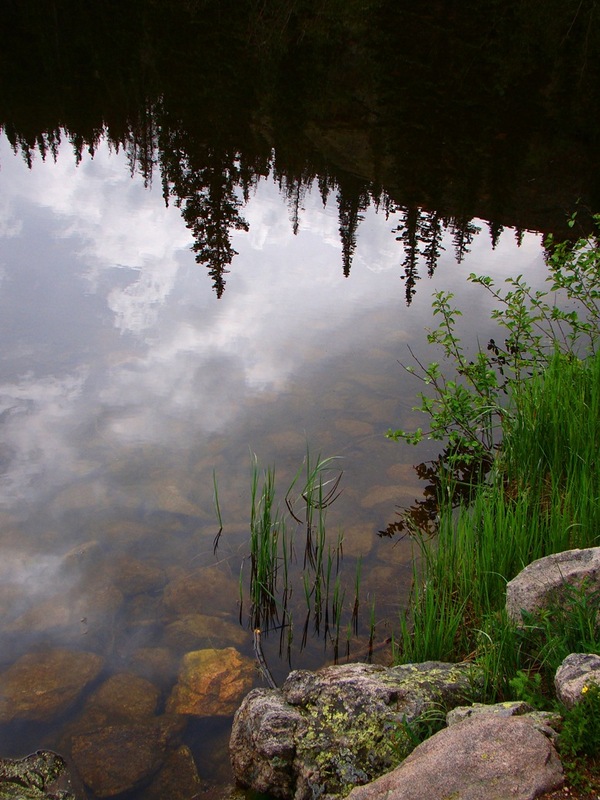 Clean air and water? The careers of teachers, nurses, police and firefighters? I'm heartbroken and angry. There are some things you can do for the parks. Assembly Bill 42 has passed the state legislature and is headed to Governor Brown's office. It will allow partnerships with non-profit organizations to keep some parks open. A few of them anyway; you can sign a petition here asking Brown to sign the bill. You can also support the California State Parks Foundation. They've been doing good work. I fear that Limekiln is a park without friends. There are certainly people who love the park (including some recent commenters), but it doesn't sit next to any urban centers where volunteers can easily donate their time. 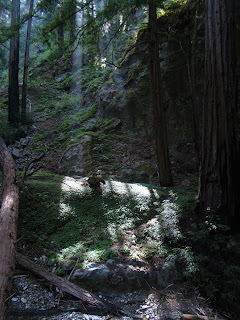 It's isolated and wild, a feature that makes it a wonderful place to explore, but it doesn't get enough visitors to support a "Limekiln State Park Foundation" as far as I know. No, I think this park will be simply swept away for budget considerations, and we will all be poorer for it. The Other California: Limekiln State Park, Part 2 - What lies upstream? Does anyone see the gnome climbing out of the fallen log? The Other California is my on-again/off-again long running series on the fascinating corners of California that don't always make onto the postcards. 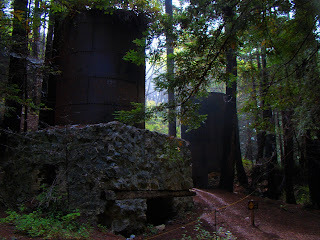 The last post concerned a little-known state park on the Big Sur Coast, Limekiln State Park. We had a look at the small bouldery beach under a beautiful bridge on Highway One. We ended up wondering what lay upstream. The first thing one notices is the redwood forest just a few yards upstream, and the park campground. 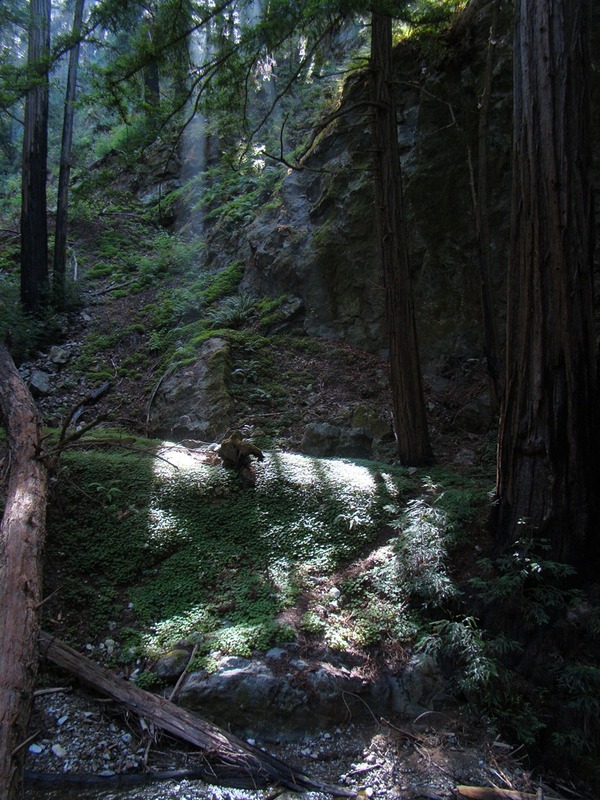 The redwood grove here is one of the southernmost of the species, and according to some sources may even be a distinct subspecies. Many of the trees were cut in the 1880s (see below), but the forest has recovered nicely, and the campground is in a wonderfully scenic setting among tall trees and a loud babbling creek. Some areas of the park were damaged in the Chalk Fire of 2008. 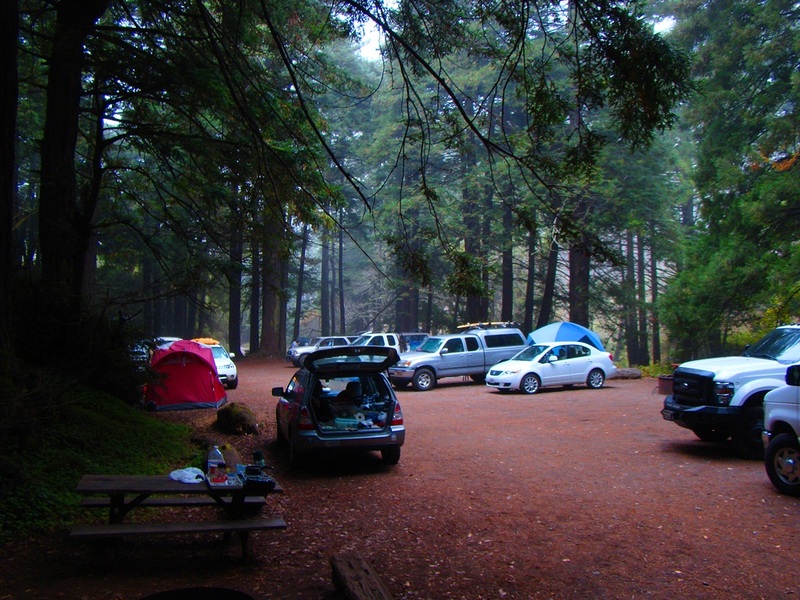 The campground is decidedly different than most state park campgrounds. Space is at a premium, and sites are very close to each other as if planners were trying to stuff as many spaces as possible in the limited flat ground. This is a clue to the heritage of the park; it was once privately owned (one hiking guide calls it "Big Sur funky"). Limekiln only became a state park in 1995. We had a sweet little experience on our visit. 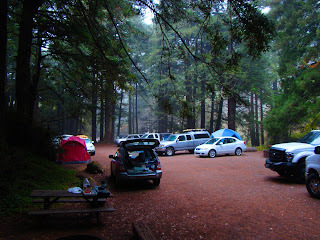 We were foolishly vagabonding, hoping to catch an empty camping spot on the Big Sur Coast...in the summer. Talk about a hopeless quest! The hosts at the camps farther south laughed when we asked about open spaces or cancellations. The young man at the Limekiln station looked at our small car, and suggested we check campsite 26 1/2, a campsite that doesn't actually exist, much like Harry Potter's King's Cross train station gate 9 3/4. There was no parking, and barely enough space for the Taj MaHayes tent, but it worked and we had a delightful night. Such a crowded campground has a potential for much noise and mayhem, but the night was quiet, and one of the darkest I can ever remember experiencing. During a late-night stroll, the only light in the whole camp was a single candle on a table, and the dim light flickered mysteriously in the trees up above. 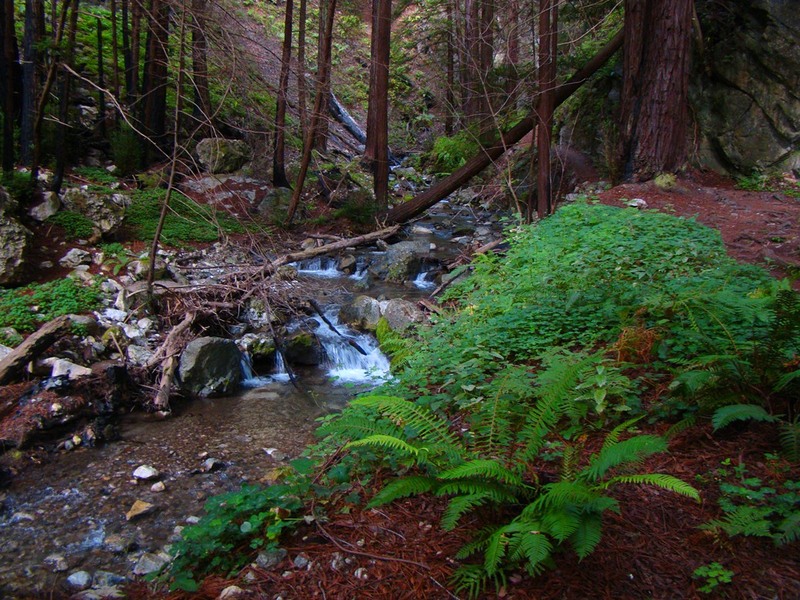 As a new state park, the hiking system is not highly developed, but the trails are quite pleasant to explore. 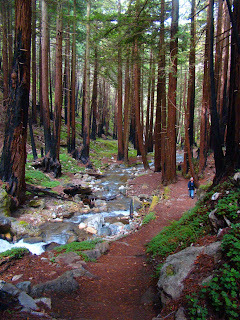 One trail follows the West Fork of Limekiln Creek to the limekilns. 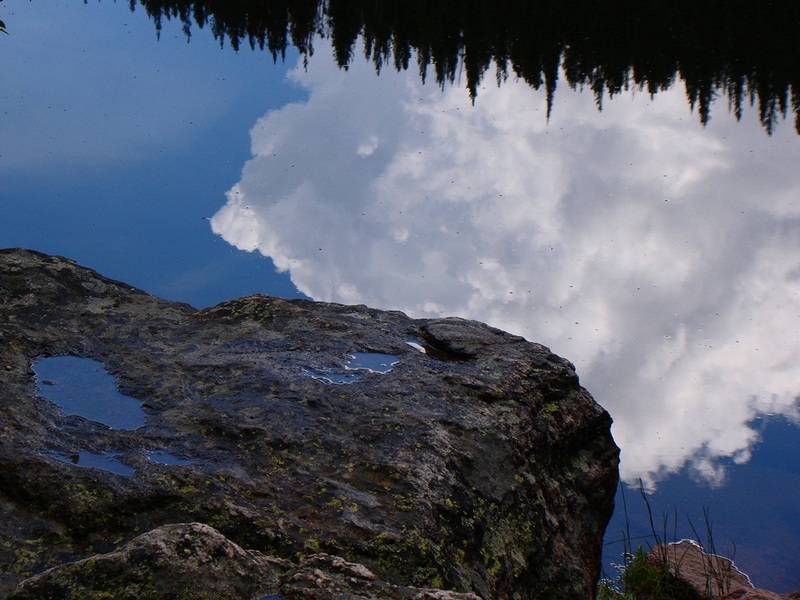 The park preserves exposures of Mesozoic granitic rocks and older metamorphic rocks, including marble. Marble is metamorphic limestone, which is an important component of concrete and cement. It must be heated to become lime, and that is what the limekilns are all about. For three years starting in 1887, a group of kilns used locally cut redwoods to bake the limestone, and the lime was transported to the beach. Ships picked up the barrels of lime for use in Monterey and other nearby towns. I was expecting brick kilns, like those I have seen in Death Valley and the Owens Valley, but these kilns were made of iron. They are slowly being reclaimed by the forest. There are even redwoods and ferns sprouting on the roof of the ovens. 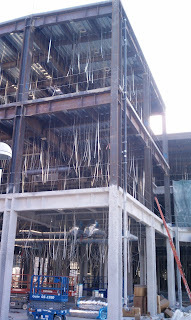 The structures were just a bit eerie to me. 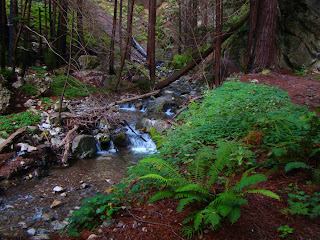 Another trail rises gently through Hare Creek. The water was sparklingly clear, and there was plenty of it, despite the late August date. The deep blue pools were inviting. I've saved the best for last. 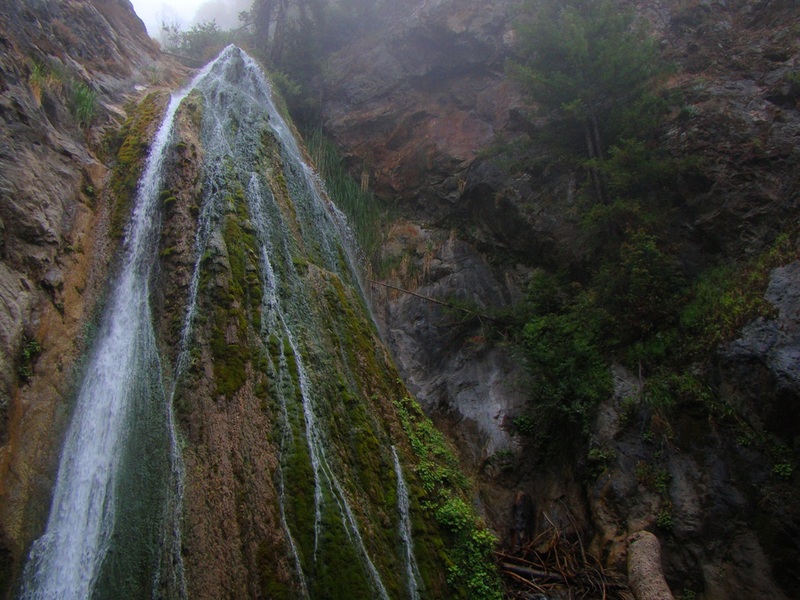 Off the Kiln trail is a side trail to Limekiln Falls. It's one of California's unique treasures. 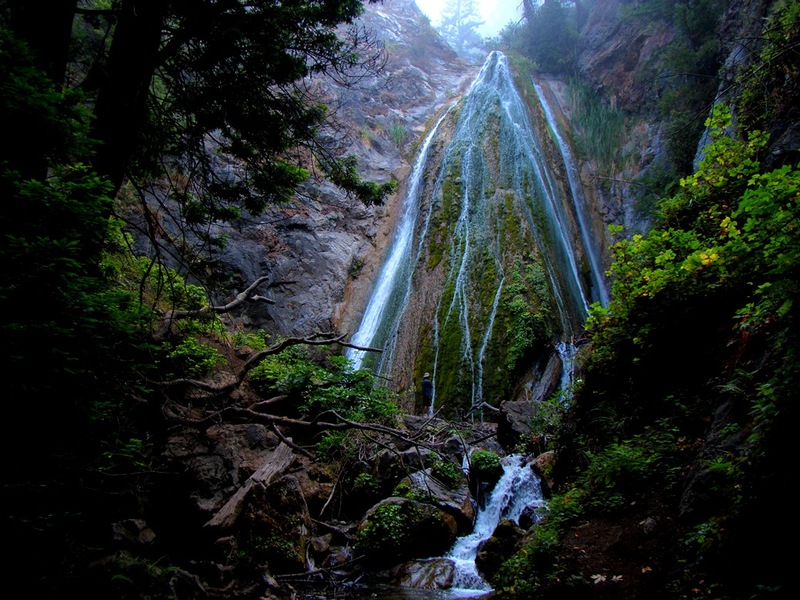 The falls are about 100 feet high, and cascade down a cone-shaped edifice that is different than the usual cliffs found in the state. Flowing through the marble, the upstream portion of the creek picks up calcium carbonate (the mineral calcite), and some of the mineral precipitates out of the water while evaporating on the flight down the falls. I'm guessing that it is a similar phenomena that has produced the beautiful Havasu Falls in Grand Canyon. The falls are one of the prettiest sights I've seen this summer. 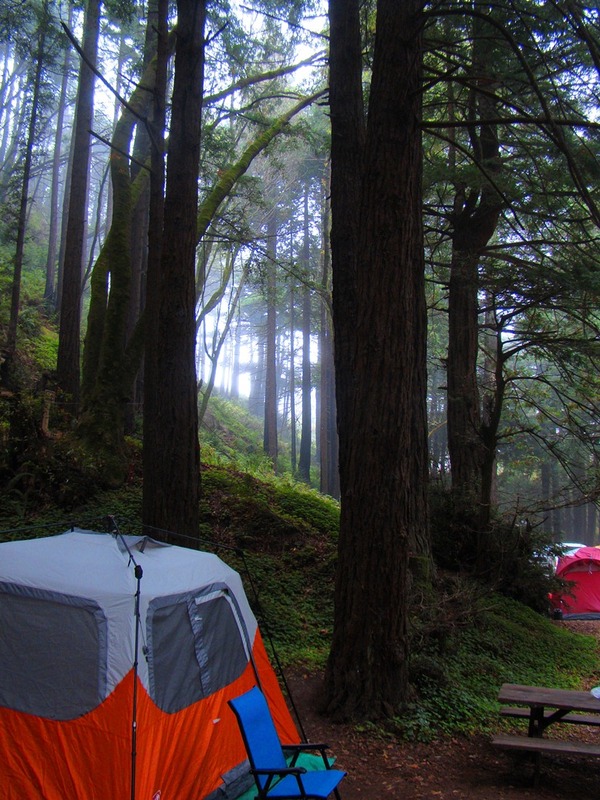 So, here is a little known state park that contains a beautiful waterfall, an inspiring redwood grove that is one of the southernmost in the world, a world-class beach, interesting metamorphic and plutonic rocks, and which includes a pleasant creek and cozy little campground. Doesn't it sound like a wonderful place to visit?